In an act of generosity, Valachi Downs principals Kevin and Jo Hickman have gifted a regally bred filly to the CatWalk Spinal Cord Injury Research Trust, founded by Little Avondale Stud’s Catriona Williams. 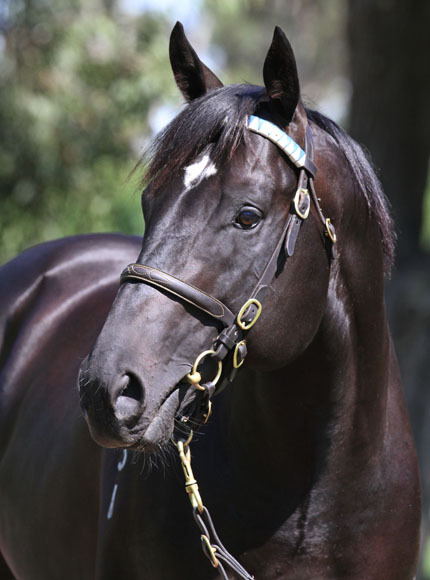 The weanling filly is by Darley stallion Brazen Beau, who will stand at a fee of A$49,500 this coming season. She is out of Stepanova, a Danehill Dancer mare whose dam, Dance On is a full-sister to six-time Group One winner and champion sire High Chaparral. “It’s a beautiful, strong family,” Valachi Downs Stud Manager Jonathan Scully said. “Hopefully Kevin gets another filly (out of the mare), because he loves to keep his fillies and sell his colts. In a double dose of generosity towards the charity, the Hickmans also purchased the Brazen Beau service at a CatWalk Trust charity event a few of years ago. The service fee was donated by Godolphin’s Sheikh Mohammed bin Rashid Al Maktoum, who has been a great supporter of the CatWalk Trust for more than a decade. “Godolphin have had a reasonably long association with the CatWalk Trust. It is a foundation that we have taken seriously and appreciate the work they do,” Godolphin Head of Sales Alastair Pulford said. “Sheikh Mohammed and Godolphin have always provided something worthwhile to help with their fundraising, because we obviously feel it is very important. “We were very happy to donate a nomination to Brazen Beau back in 2017. I was there for the auction and witnessed a very spirited bidding duel between Kevin Hickman, whose generosity is unbelievable, and Tony Rider, who was the underbidder. Hickman selected Stepanova for the mating and at New Zealand Bloodstock’s Yearling Sales earlier this year he decided to gift the resulting filly back to the CatWalk Trust. “Kevin has always wanted to do something for CatWalk and for Catriona with all the work she has done,” Scully said. “Kevin came to me at Karaka this year and said he had come up with a cunning plan. The filly is earmarked to go through Valachi Downs’ draft at Karaka next January and Scully is over the moon with the amount of support this incentive is receiving from a number of people. “We are hoping to put her through Karaka next year in Book 1,” Scully said. “New Zealand Bloodstock have confirmed that they will waive the entry and commission fees, which is great, so all proceeds will go directly to the CatWalk Trust. “Hopefully we might get someone prepared to stump up and pay top dollar for a quality horse and hopefully we can get them to go a bit further because it’s all going to a charity. Scully said Hickman has had a longtime interest in the CatWalk Trust and his close friendship with Snow Reardon was a driving factor for his support for the charity. “One of Kevin’s great mates, Snow Reardon, has been in a wheel chair since he was 18 or 19 when he was injured in a car accident. Kevin has always been a great supporter of Snow his entire life,” Scully said. Williams has been overwhelmed by the generosity shown by the Hickmans, which she said would help the Charity’s cause tremendously. “CatWalk cannot thank Valachi Downs enough for their incredible generosity of gifting their stunning Brazen Beau filly to CatWalk. “I’ve been fortunate to spend time with a number of former jockeys who have spinal injuries, most recently Sophie Grant and Sophia Malthus. “Like they would give anything to be back on their feet again.